This post is in Dog Blogging, Open Thread, Other. @Bobbiebud: That’s great, care to share the link? Originally, Emma Mertens’ family asked for people to emails and letters to Emma, but she has received so many that it’s become overwhelming. @Another Scott: Thanks, updating now. I did this yesterday before I found out about the Facebook page. 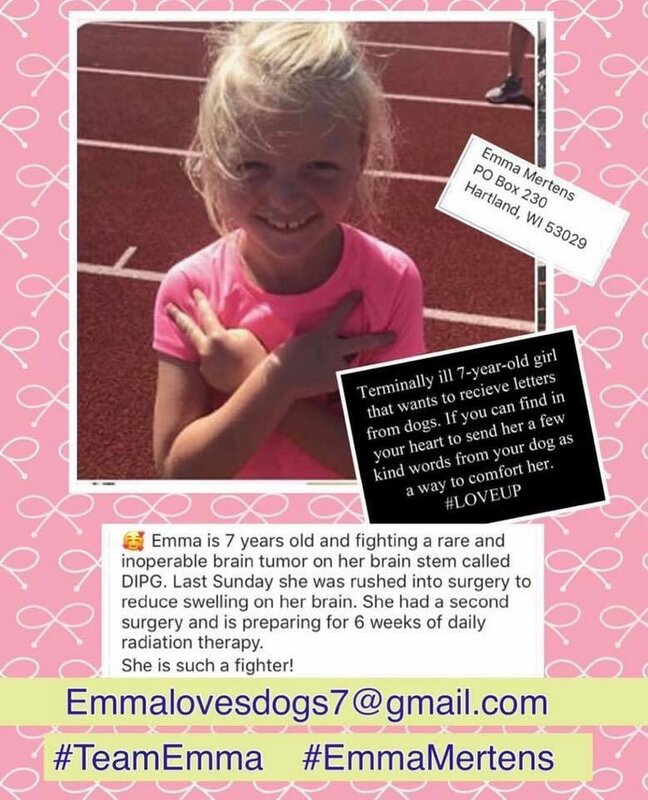 Emma is such a sweetie and I can’t imagine how scary this has been for the whole family. @MomSense: Yeah, before folks popped up here to provide that info I sent off an email with 6 or 7 pictures and well wishes. When one arrives at ATL, on takes the underground train from the terminals to the baggage claim/arrivals area, whereupon three escalators take people up to the unsecured area where they can be greeted by friends or family or limo drivers. (Note: as often as I land here, NO ONE from the Juicetatiat ever greets me!). There are always wives and kids and whatnot holding signs welcoming people back home from long trips, particularly for people returning from active service. Struck me as a bad idea…. But I said no no no. This is first I’ve heard about Emma, but tomorrow is Mr. Cuba’s 100th birthday. He had asked for 100 cards; at the beginning of the week he had received around 3,000. Any updates on this, his birthday eve? (Note: as often as I land here, NO ONE from the Juicetatiat ever greets me!). @SiubhanDuinne: Sheppard AF Base threw a party for him. @SiubhanDuinne: I have not heard anything more. No one tells me anything. As we can tell from none of you telling me about the Facebook request regarding Emma before I published this post! You sound like old James Forsyte. Can we send pics of kats? All we’ve got are kat pics… We saw lots of doggos on our walk this afternoon. If we’d only known we could have got dog pics – dozens. I’ll try some kat pics to give the doggos on the facebook something to do. Life is tough. Thank you dogs (and kats)! @SiubhanDuinne: I’ll have to take your word for it. @Dan B: I’m sure, just please post them to the Facebook page linked to at the top of the post. @SiubhanDuinne: The kid did her tech training at Sheppard. @SiubhanDuinne: The last I saw he was up to around 16,000 cards. @SiubhanDuinne: Sheppard Air Farce base. I posted photos of Gaby in the snow. @Pogonip: That was the first one I posted. Here’s the link. I’m going to repost it towards the middle to end of March. Wow. That’ll larn ‘im to tell folks about his hundredth birthday. Bet he doesn’t try that again next year. From Galsworthy’s Forsyte Saga. Old James, one of the senior generation, was forever complaining that nobody ever told him anything. @Adam L Silverman: I am humbled. Sent Emma a pic of Murphy sliding upside down head first in the snow. Fierce guardian dog hides a secret goofball under all the fur. Thanks for the tip. Our pup Bailey just sent an email, photo and virtual nose lick to Emma.